This is the best chia pudding recipe, inspired by the back-to-school classic, PB&J. 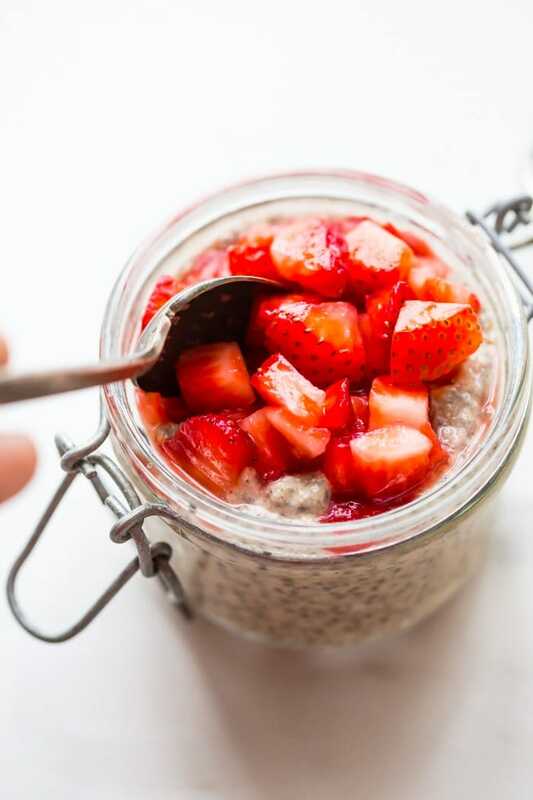 With only a few ingredients, this is the best chia pudding recipe for a reason: it’s perfectly sweet, filling, light, and refreshing, packed with flavor from the almond butter or peanut butter and sweet macerated strawberries. Such a perfect paleo chia pudding recipe or vegan chia pudding recipe! I’ve mentioned it before, but I love when a recipe jumps to the front of the line. It’s like those stereotypical scenes in any rom com or blockbuster comedy: the hot girl with the cartoonishly short skirt gets to zip to the front of the line outside the club. She’s ushered in immediately, and then twelve drinks later, she’s pregnant or in jail or something. OOPS! The hot girl in this blog? This best chia pudding, PB&J inspired, so easy to make ahead, and filling, refreshing, sweet, and flavorful. I had a list of like twelve other things I should post first, but I couldn’t resist sharing this recipe for the best chia pudding with you as soon as humanly possible. It’s just perfect for back to school and into early fall! Mix a few things together and boom: you’re pregnant. Mix a few things together and boom: your husband will want to get you pregnant. 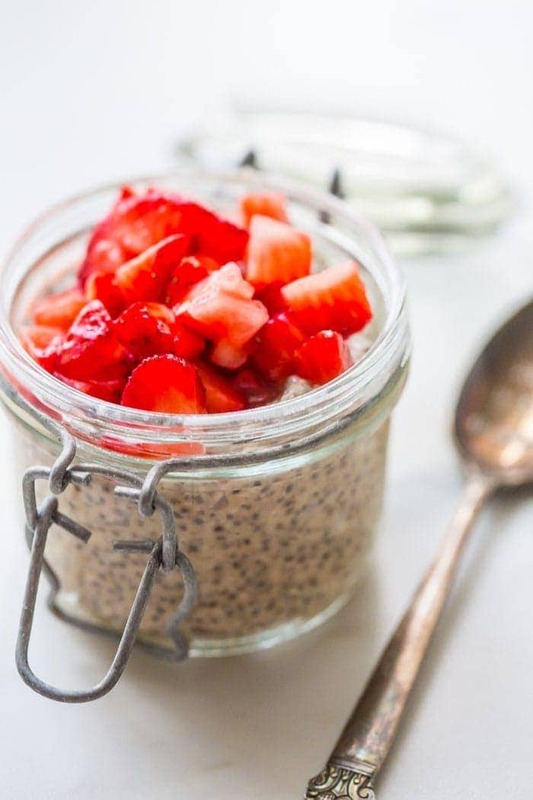 This idea for the best chia pudding started out as an idea for PB&J inspired chia pudding, an idea that lit up my brain when I was trying to go to wean myself off my nightly melatonin habit and get-TF to sleep. Instead, I was planning amounts and ingredients, anxious for the morning to roll around to test out my recipe. With school back in session, it’s been harder than ever to balance breakfast, exercise, and preschool rituals, so this best chia pudding sounded like the perfect solution. Except, of course, it didn’t become the best chia pudding until I tasted it the next morning. I dropped Leo off at grandma’s for the day, suggested we go on an outing since it was actually reasonable weather, and ran home for a run, a quick photo shoot, and a bit of breakfast. When I took that very first bite, sitting in the car with my little jam jar waiting for grandma and Leo to return, I thought I might just die. 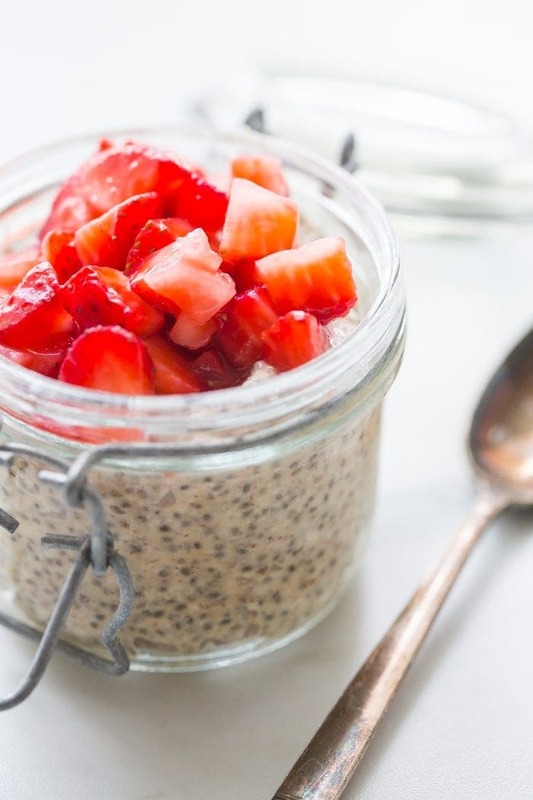 I’ve been eating chia puddings for years, always having loved the refreshing coolness of the dish during warmer weather, feeling bogged down by heavy egg and protein dishes. The paleo pusher in me always peer pressures the egg, though, so it’d been a while since I’d given myself permission to eat only a chia pudding. 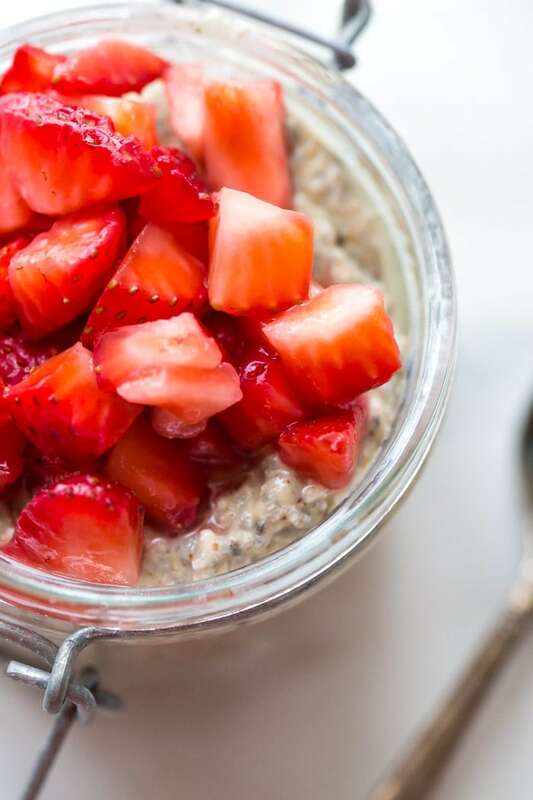 But there was something about this rich chia pudding that makes it the best chia pudding: the perfect amount of sweetness, the perfect amount of richness, the nuttiness from the almond butter or peanut butter and the ripe, macerated strawberries. It was perfect. The PB&J inspiration is just perfect for back to school while we still have this warm weather: nice and cool, filling but light, seasonal and fresh. We’re mostly paleo at home, and I try to avoid peanut butter due to the goitrogens in peanuts for thyroid health. Because of this, I used almond butter instead of peanut butter, but peanut butter would be fantastic in this best chia pudding recipe, for sure. 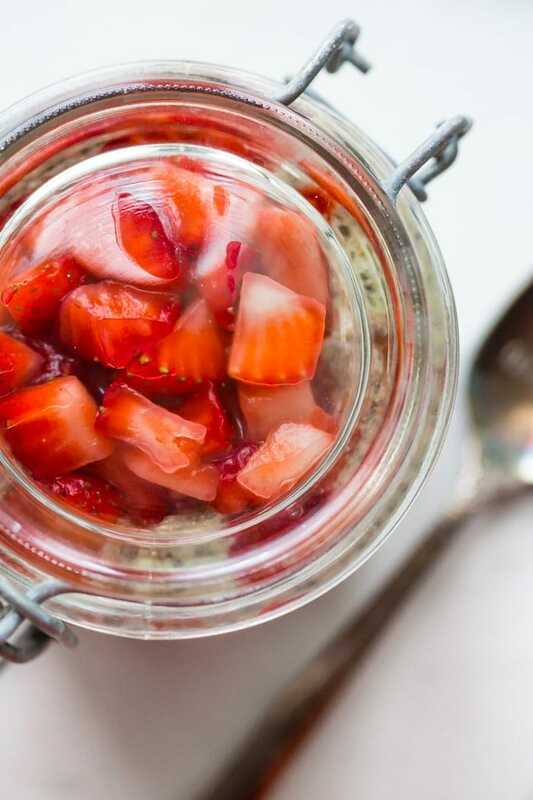 You could also substitute other berries for the strawberries, but the sweet maceration that happens with fresh strawberries just can’t be beat. You’ll love this recipe for the best chia pudding because it’s easy and perfectly sweet, filling without being heavy, fresh and full of flavor. It’s so easy to make ahead and grab to take to work or school! You could easily double this recipe, making enough for the whole family. This is the best chia pudding recipe, inspired by the back-to-school classic, PB&J. With only a few ingredients, this is the best chia pudding recipe for a reason: it's perfectly sweet, filling, light, and refreshing, packed with flavor from the almond butter or peanut butter and sweet macerated strawberries. Such a perfect paleo chia pudding recipe or vegan chia pudding recipe! Mix all chia pudding ingredients together and chill at least 1 hour or overnight. Mine was ready after only about an hour, though the seeds wont plump up quite as much. Meanwhile, mix together all strawberry topping ingredients and set aside. Make sure you do this at least 30 minutes ahead, up to overnight, so the berries macerate and becoming softened with delicious juice. 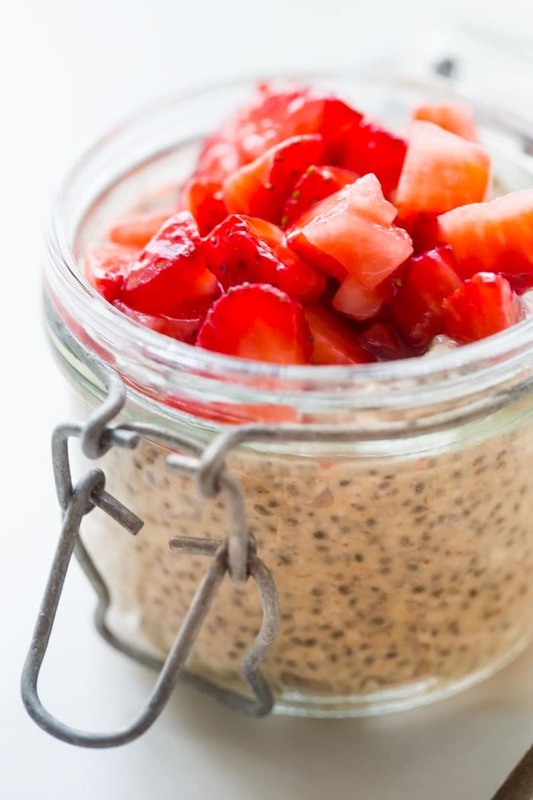 When ready to serve, simply top chia pudding with strawberries and devour!